It’s the same HUMIRA you trust, with less pain immediately following injection. * Whether you're first starting HUMIRA or have been taking it for some time, ask your doctor for HUMIRA Citrate-free. †Change applies only to the HUMIRA Pen. Although the injection might now feel different from previous HUMIRA injections, you should continue to follow the injection technique you learned from training. There is no change in how HUMIRA is stored. It’s important to use the proper injection technique and follow the dosing schedule for your treatment with HUMIRA Citrate-free. The recommended dose is 1 HUMIRA Pen or syringe (40 mg/0.4 mL) every other week. Always follow your doctor's instructions about when and how often to take HUMIRA Citrate-free. For more information, refer to the Patient Instructions for Use, and the Medication Guide located inside your HUMIRA Citrate-free carton, and within the Full Prescribing Information. If you have any questions about injection, you can speak to a registered nurse about your HUMIRA treatment and request in-person injection training. Just call 1.800.4HUMIRA (1.800.448.6472). Make sure you have been shown how to inject HUMIRA Citrate-free before you do it yourself. Your first injection should be given under the supervision of a health care professional. Remember to keep your HUMIRA Citrate-free refrigerated in its original container until ready for use. Note: 40 mg/0.4 mL is also available in a prefilled syringe. Continue taking HUMIRA Citrate-free as directed by your doctor. Remember, HUMIRA Citrate-free is a treatment, not a cure. Your doctor can tell you if and when you should stop taking HUMIRA Citrate-free. If you experience any adverse reactions or discomfort when taking HUMIRA Citrate-free, discuss them with your doctor right away. Common side effects of HUMIRA include injection site reactions (pain, redness, rash, swelling, itching, or bruising), upper respiratory infections (sinus infections), headaches, rash, and nausea. These are not all of the possible side effects with HUMIRA. Tell your doctor if you have any side effect that bothers you or does not go away. HUMIRA is a prescription medicine used alone, with methotrexate, or with certain other medicines to reduce the signs and symptoms of moderate to severe rheumatoid arthritis in adults, may prevent further damage to your bones and joints, and may help your ability to perform daily activities. The chart below explains a standard HUMIRA Citrate-free dosing schedule. Always follow your doctor's instructions about when and how often to take HUMIRA Citrate-free. Important: You must pay attention to your starting dose—it is different than your maintenance dose and is a critical part of taking HUMIRA Citrate-free as prescribed. Make sure you have been shown how to inject HUMIRA Citrate-free before you do it yourself. Your first injection should be given under the supervision of a health care professional. Remember to keep your HUMIRA Citrate-free refrigerated in its original container until ready for use. On Day 22 you will begin your regularly scheduled dose of 1 HUMIRA Pen (40 mg/0.4 mL) every other week. *First dose can be administered as 2 injections in 1 day or as 1 injection per day for 2 consecutive days. On Day 29 you will begin your regularly scheduled dose of 1 HUMIRA Pen (40 mg/0.4 mL) every other week. HUMIRA is a prescription medicine used alone or with certain other medicines to reduce the signs and symptoms of psoriatic arthritis in adults, may prevent further damage to your bones and joints, and may help your ability to perform daily activities. On Day 29 you will begin your regularly scheduled dose of 1 HUMIRA Pen (40 mg/0.4 mL) every week. HUMIRA is a prescription medicine used to reduce the signs and symptoms of moderate to severe hidradenitis suppurativa in adults. HUMIRA is a prescription medicine used to reduce the signs and symptoms of ankylosing spondylitis in adults. HUMIRA is a prescription medicine used to treat non-infectious intermediate (middle part of the eye), posterior (back of the eye) and panuveitis (all parts of the eye) in adults. Is HUMIRA Citrate-free different from HUMIRA original presentation? The active ingredient (adalimumab) is the same as it has been for over 15 years, with the same results of HUMIRA you’ve come to count on. Citrate buffers associated with pain on injection, and other inactive ingredients, have been removed. Other enhancements include a thinner needle and 50% less liquid to inject compared to the original presentation. The HUMIRA Pen has also been enhanced to include a larger viewing window and painted numbers on the caps. And, the black needle cover is not made with natural rubber latex. Is the actual Pen device the same as the previous Pen? 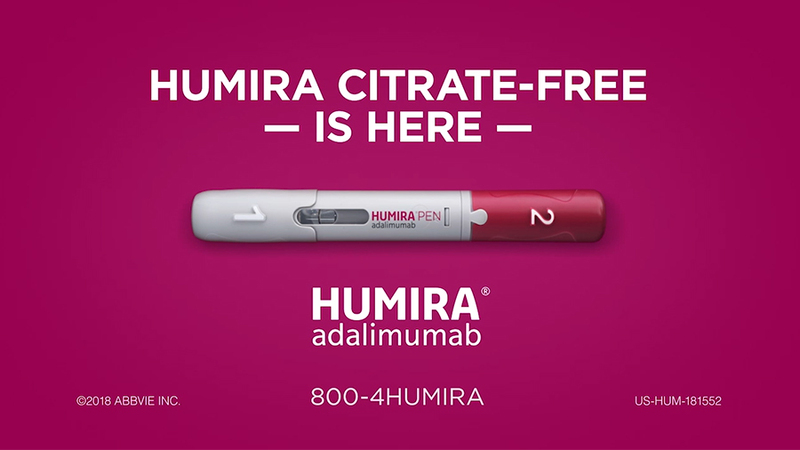 Yes; however, HUMIRA Citrate-free also features enhancements such as a thinner needle, a larger viewing window and painted numbers on caps. The black needle cover of the Citrate-free Pen is not made with natural rubber latex. If I'm already taking HUMIRA, will I need a new prescription for HUMIRA Citrate-free? Yes. A new prescription must be written by your doctor, and a new prior authorization (PA) may be required depending on your insurance. Will I be automatically switched to HUMIRA Citrate-free? No. Talk to your doctor about HUMIRA Citrate-free, and decide together whether HUMIRA Citrate-free is right for you, or if you should remain on the original presentation of HUMIRA. How will I know if I am receiving HUMIRA Citrate-free? HUMIRA Citrate-free is transitioning to a blue box. For a short period of time, HUMIRA Citrate-free may arrive in one of several different packages. No matter the color of the box, look for the 29-gauge needle call-out and updated liquid volume. Let your specialty pharmacy know if you have any questions or concerns about the HUMIRA you receive. Does HUMIRA Citrate-free still have 14-day room temperature storage? Yes. The storage and handling requirements remain the same. HUMIRA Citrate-free can be stored at room temperature for up to 14 days. If not used within that time, it should be discarded. AbbVie’s ongoing commitment to improving your HUMIRA experience continues. HUMIRA Complete is here for you. Your dedicated Nurse Ambassador§ can support you as you become more familiar with the new injection experience and answer any questions you may have about HUMIRA Citrate-free. §Nurse Ambassadors do not give medical advice and will direct you to your health care professional for any treatment-related questions, including further referrals. Complete and sign the HUMIRA Ambassador enrollment form provided to you by your physician. You can also call 1.800.4HUMIRA (1.800.448.6472) to enroll in the Ambassador Program. Eligibility: Available to patients with commercial prescription insurance coverage for HUMIRA who meet eligibility criteria. Copay assistance program is not available to patients receiving prescription reimbursement under any federal, state, or government-funded insurance programs (for example, Medicare [including Part D], Medicare Advantage, Medigap, Medicaid, TRICARE, Department of Defense, or Veterans Affairs programs) or where prohibited by law or by the patient’s health insurance provider. 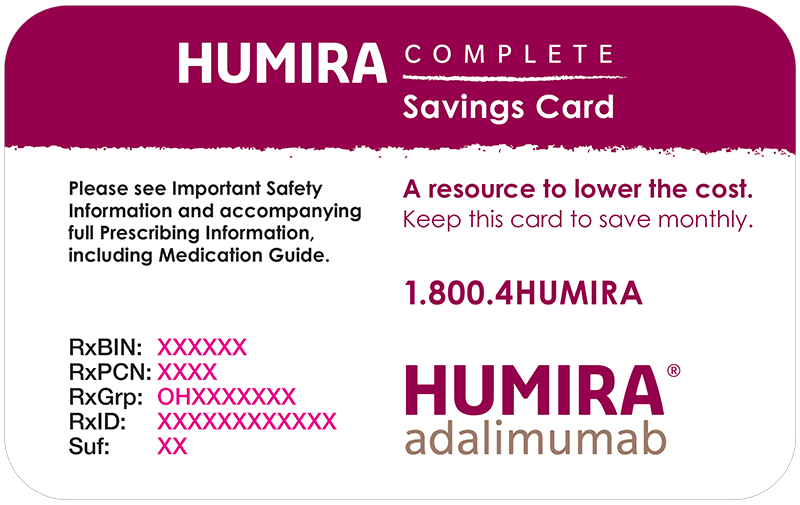 If at any time a patient begins receiving prescription drug coverage under any such federal, state, or government-funded healthcare program, patient will no longer be able to use the HUMIRA Complete Savings Card and patient must call HUMIRA Complete at 1.800.4HUMIRA (1.800.448.6472) to stop participation. Patients residing in or receiving treatment in certain states may not be eligible. Patients may not seek reimbursement for value received from the HUMIRA Complete Program from any third-party payers. Offer subject to change or discontinuance without notice. Restrictions, including monthly maximums, may apply. This is not health insurance. Please see full Terms and Conditions.